Last month I had the best time in Kansas City, otherwise known as the “Paris of the Plains.” It was my first time in Missouri, the destination was a Christian conference by IHOP (International House of Prayer…not pancakes). I stayed with my friend Michelle and her hospitable family in Kansas. What does one do in the midwest? Surprisingly, the coffee scene is pretty big here. 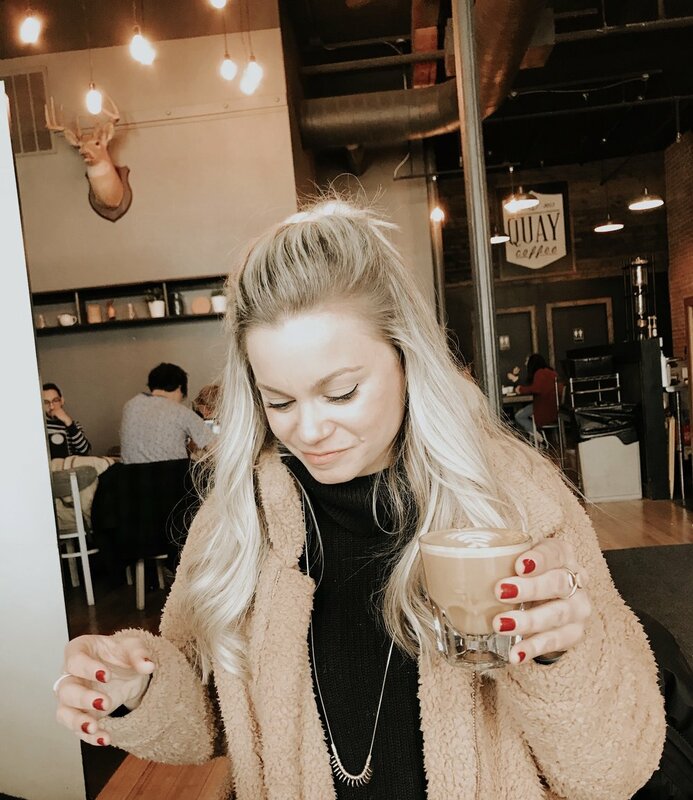 I complied a list of recommendations from people who have lived in the area and we set off on a coffee crawl hopping from coffee shop to coffee shop. If you find yourself in Kansas City for some reason check these out! Although, I might just be writing this post for myself haha. The baristas’ at Quay are some of the friendliest I’ve met. When going to a new place I try to keep an eye out something unique on the menu. The guy before me ordered an amazing looking coffee, the “Gibraltar”. I went with that, it was a a double-shot of expresso and a bit of milk. Also, an aesthetic dream. I ironically put this in second…hah. I ordered a delicious honey lavender latte which was the best I’ve ever had! Outside the window it started snowing huge chunks of snow, the perfect cafe backdrop. This was the ultimate hipster location. There is funky art on the brick walls and beanies worn by all who enter. Even a dog came into chill while his owner flipped through a novel. I can never resist a good slowly prepared pour over and it seemed like the perfect place for it. The pour over came in a science beaker, as one would expect from a coffee shop so odd and yet so…correct. At this point in the coffee crawl we had our fair share of caffeine. I was tempted to get a tea but alas, coffee was what I set out for. The shop has two floors and plenty of light. Upstairs is a roastery where you can watch the team prepare the beans. I asked what they had on drip and was given a long and passionate description of the origin of the beans and the subtle blueberry notes. The notes did not disappoint. If you’re in a city for a short amount of time this might be the best way to experience all the coffee.